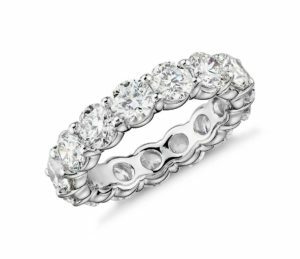 A JEWELER’S ADVICE – DON’T RUSH THE WEDDING BANDS! When you find that special someone to share the ultimate love with, the beautiful moment is celebrated with a promise represented by your first keepsake – your engagement ring. When that promise becomes a lifetime commitment, the engagement ring is joined by a wedding band. And it’s quite common for the store selling you the engagement ring to push for you to purchase the wedding bands at the same time. That’s usually a mistake. It’s important to take the time to select a design you absolutely love, and that’s not a decision to be made in haste. Too often, I have a bride coming in to my office saying that she hates her band and asking how to change it without hurting the groom’s feelings. The best way to avoid this pitfall is simple – do not buy your wedding bands when you purchase your engagement ring. This advice is almost always met with resistance, and comments such as “I trust you, and am ready to buy, why wait?” and “We are so in love and want to move forward with all our plans, can’t we just get this checked off the list?” I explain that waiting is entirely in their best interest. The best time to buy your wedding bands is three to four months prior to your wedding. If you decide on a shorter engagement period, the midpoint between wedding and engagement is best; two months is sufficient if time is tight. The primary reason not to purchase too soon is exactly why the store is pushing hard for you to buy the rings immediately. The chance of the bride knowing the wedding band design she ultimately desires is quite small at the time of engagement. Most brides think they know, but that opinion changes the vast majority of the time. She has never before worn a diamond ring of this magnitude and will need time to get a feel for it, which can take weeks or months. I have had countless brides who were sure of one design ultimately switch to a totally different style. Price is also a major factor. You must resist the jewelry store salesperson’s offer of ‘special discounts’ if you purchase wedding bands immediately with the engagement ring. The discount is fiction – the store is trying to take advantage of your moment of excitement to sell you wedding bands at what in reality is a high retail price. Also ignore the common advice of bridal publications to buy around Christmas or Valentine’s Day. In fact, Christmas and Valentine’s Day when prices are the highest – the advertised ‘holiday sales’ are a ruse, where prices are first marked up, then ‘discounted’ to a level higher than regular prices. A smart shopper, with time, can find a true wholesaler where prices are always a fraction of retail. Of course, taking your time to buy wedding bands doesn’t mean waiting until the last minute. I recommend buying three to four months in advance because there is so much going on in the weeks before the wedding. Some wedding bands need to be custom designed, a process that can take many weeks. You must both be available to check sizing and workmanship, and your time becomes precious as you approach the wedding day. As your wedding bands represent your promise to each other, they are a keepsake of your eternal love. Every day they will take you right back to that magical moment when you said, “I do” and began your love story together.